Professional Road Nationals to be Broadcast on Multiple Media Platforms - SoCalCycling.com - Southern California, Cycling, Cycling News, Amgen Tour of California, Bicycle Racing, Fun Rides, Cycling Event Schedules, Mountain Biking, Cyclocross, Cycling Photos, Cycling Videos, Interviews, Product Reviews. America’s top men and women professional cyclists will vie for Stars-and-Stripes jerseys at the 2013 Volkswagen USA Cycling Professional Road & Time Trial National Championship, which for the first time in the event’s 28-year history will be held in Chattanooga, Tenn., on May 25 and 27. It will also feature the inaugural professional women’s national championships. The individual time trials will be contested Saturday on a challenging course at the Volkswagen Chattanooga Plant. On Monday, the road races will feature the climb up Lookout Mountain which will play a pivotal role in determining our country’s best male and female champions. This year’s event will be available across multiple media platforms. The time trial will be carried live online and on mobile devices by Tour Tracker. The live broadcast of the final two hours of the men’s road race from 4-6 p.m. EDT on Monday, May 27 will feature highlights from the time trials and the women’s road race on Universal Sports. Craig Hummer, Robbie Ventura and Kristin Armstrong will handle the commentating duties. Cycling fans can follow the entire event live virtually anywhere in the world through the Tour Tracker application. The coverage will include a live video stream from the time trial and road race online and an app that is available for iOS and Android devices. Tour Tracker will also provide fans with streaming video of the events from several different vantage points. The primary live view will update viewers on the race situation, with position and time gaps between the breakaway, chase and peloton. This also will offer a GPS map and profile of the course and a text play-by-play. Additionally, the viewer can see photos and videos from the day’s events as well as final results, king/queen of the mountain and most courageous rider standings. The Tour Tracker app can be downloaded in the App Store. A one-hour recap show is scheduled to be broadcast on NBC Sports Network at 1 p.m. EDT on Sunday, June 2. This will be a recap of the entire event, including interviews and highlights from the men’s and women’s time trials and road races. For the first time in the event’s 29-year history, the women will compete for professional national titles. The U.S. is the only country to showcase the women racing the same courses on the same days and for the same prize purses as the men. Among the women scheduled to compete in Chattanooga is defending champion Megan Guarnier (Mountain View, Calif./Rabobank), who won the elite women’s national championship road race in 2012. Amber Neben (Lake Forest, Calif./Pasta Zara Cogeas), who topped the field in the time trial at the 2012 Elite, U23, Juniors & Paralympic Road National Championships in Augusta, Ga., is unable to compete after crashing in the time trial at the Amgen Tour of California. Neben’s absence leaves the door open for other top competitors in the women’s field including Evelyn Stevens (Dennis, Mass./Specialized-lululemon), Carmen Small (Durango, Colo./Specialized-lululemon), Jade Wilcoxson (Talent, Ore./Team Optum p/b Kelly Benefit Strategies), Alison Powers (Pinecliffe, Colo./NOW and Novartis for MS), Janel Holcomb (San Diego, Calif./Team Optum p/b Kelly Benefit Strategies), Kristin McGrath (Boise, Idaho/Exergy TWENTY16), Robin Farina (Smartsville, Calif./NOW and Novartis for MS) and Alison Tetrick (Mill Valley, Calif./Exergy TWENTY16). On the men’s side, one of the two defending national champions are scheduled to toe the line and defend their Stars-and-Stripes jerseys. The winner of the road race in Greenville in 2012, Timmy Duggan (Nederland, Colo./Team Saxo-Tinkoff), is a viable threat to repeat as national champion, but seven-time national champion Dave Zabriskie (Westlake Village, Calif./Garmin-Sharp) is unable to compete due to a crash in California. A few of the riders vying to earn the Stars-and-Stripes are Brent Bookwalter (Asheville, N.C./BMC Racing Team), Matthew Busche (Wauwatosa, Wis./RadioShack-Nissan) and Lawson Craddock (Austin, Texas/Bontrager Cycling Team). Bookwalter is poised to improve on his third-place result in the time trial last year. 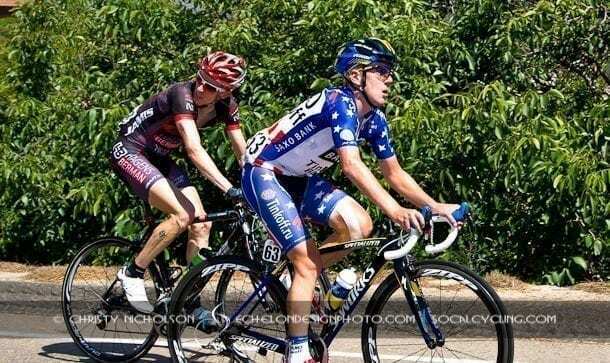 Busche used a late sprint to narrowly win the road race at the 2011 event while Craddock recently won Best Young Rider at the Amgen Tour of California. Noted sprinter Tyler Farrar (Seattle, Wash./Garmin-Sharp), who won the third stage of the Amgen Tour of California on May 15, is also scheduled to compete. The picturesque courses will utilize many of the iconic roads from the former Tour de Georgia UCI stage race. The time trial course will be held adjacent to the Volkswagen Chattanooga Plant and features rolling terrain with few turns. Riders will complete two out-and-back runs of 9.5 miles each for a total of 19 miles. The course layout has four turnarounds and will allow spectators to see each rider multiple times. The road races will showcase downtown Chattanooga along with the tough climb up Lookout Mountain. The men’s and women’s races will begin with a 5.1-mile start circuit — one circuit for the women and three for the men. The same circuit will be used for the finish of each race. The course then takes the riders on a relatively flat run along Broad Street to begin the climb up Ochs Highway. The climb is approximately three miles and climbs 1,150 feet each lap. The race will top out on top of Lookout Mountain and descend on Scenic Highway to return to downtown via Broad Street. Men will complete four laps up the climb, while the women will do two laps. The “long lap” is 16.1 miles in distance. The men and women will complete the start/finish circuits each lap of the “long lap” and will finish the race with three 5.1-mile circuits each. The course will cross the Market Street and Veterans Bridge each lap, and spectators will see the riders cross through the start/finish line 11 times during the men’s race and eight times during the women’s race. The racing begins Saturday at 8:30 a.m. with the U.S. Handcycling Series Time Trial. The top women are slated to contest the time trial beginning at 11 a.m. before the men take the course at 2 p.m. The women’s road race opens Monday’s racing at 9 a.m., when they’ll begin their 102-kilometer contest. The handcycling criterium national championship is slated to begin at 12:30 p.m. The 165-kilometer pro men’s road race, which begins at 1:15 p.m., caps the event.s well as ancillary events in Chattanooga.